GM COO Fritz Henderson said there are ongoing negotiations about Saab, but he had no news about the future of Saturn or Hummer. Main point: GM intends to go to market with 4 core brands: Cadillac, Chevrolet, Buick and GMC. DETROIT — When General Motors submits its viability plan to Congress next month, it will outline what its future U.S. market share will need to be with just four core brands. GM plans eventually to go to market with just the four core brands: Chevrolet, Cadillac, Buick and GMC. Pontiac will shrink "significantly," GM COO Fritz Henderson said. Saturn, Saab and Hummer are under strategic review. Speaking last week at the Automotive News World Congress, Henderson said GM is finalizing the viability plan it must submit to Congress on Feb. 17. It is looking at industry volume assumptions and pricing to determine what market share GM will need to be viable. In that plan, GM also is expected to supply more specifics on what it will do with Saturn and Saab. Hummer has been for sale since last summer. Henderson said the "status quo" for Saturn will not work. Henderson stopped short of saying GM would shutter Saturn, but he made it clear that changes are ahead for the division. As Automotive News first reported, another option is for Saturn dealers to buy the division. Likewise, GM is working with the Swedish government on a plan for Saab. "We're engaged with the Swedish government as we speak," Henderson said. "We've talked to investors, and we'll see where it goes." Three-quarters of Saab sales are in Europe, he said. "Saab is not a U.S. strategy." The four core brands accounted for 83 percent of GM's U.S. sales, Henderson said. GM is investing heavily in Buick in China, he said, and that will benefit Buick in the United States. "When you see the new LaCrosse, it will be very familiar to the one you've seen GM reveal in China." Asked whether GM should have followed the 2006 advice of Jerry York, Las Vegas billionaire Kirk Kerkorian's former representative on the GM board, to sell Hummer and Saab, Henderson said, "With the benefit of hindsight, you might say we should have moved then." If oil prices remain low — they were around $40 a barrel last week — GM would struggle to sell key future vehicles such as the Chevrolet Volt plug-in hybrid, Henderson said. But GM plans its future business around oil being $130 to $160 a barrel in the next few years. In 2009, GM expects oil to average about $53 a barrel, Henderson said. He identified one lesson of 2008: "Things can always get worse. Don't declare victory too soon." For example, Henderson said, "What if we see an $800 billion stimulus package and it doesn't work?" And it is unsettling to see "the U.S. economy running at a 1982 level, when the population is 50 percent higher" than it was then. But, Henderson assured his audience: "Things will get better. We just don't know when." The U.S. and Chinese economies will lead the world out of its funk, he predicted. 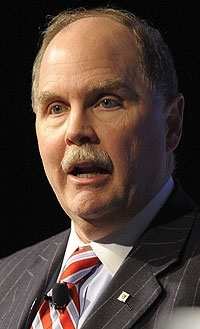 Henderson said GM's challenge going forward is bigger than streamlining operations and developing advanced technology. The company also must fix its image. "Our job is not only to build vehicles people want to buy," Henderson said. "But to communicate that people want to buy our vehicles."